Moscow, Russia, July 20, 2016 — Top Systems, the innovative developer of advanced parametric design software, has announced the release of version 15 of its T-FLEX CAD® system. Latest release of T-FLEX CAD introduces new user interface, optimized window management, better overall system performance, significant improvements in both 3D modeling and 2D drafting, enhanced sheet metal functionality, advanced photorealistic rendering, further development of parametric tools, increased productivity of complex and large assembly models. 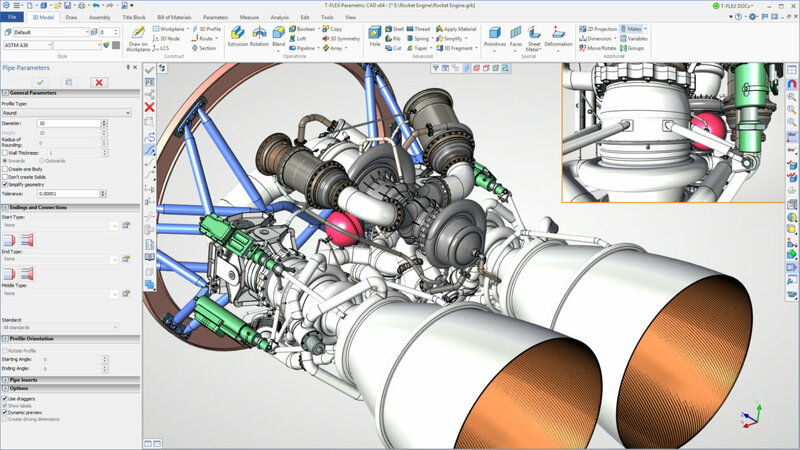 Top Systems has added hundreds of customer-requested enhancements that complement new tools for design, simulation, as well as efficient team collaboration and knowledge sharing. T-FLEX CAD 15 runs on the latest version of the Parasolid kernel and uses the new high-performance algorithms for working with large assemblies, 3D models and 2D views achieving substantial acceleration gains at various time and resource consuming operations. Multi-display support, 4K monitor operations and stereo output have been vastly improved. T-FLEX CAD 15 provides a highly interactive environment for viewing designs as well as for creating photorealistic renderings that can be used to showcase designs. Both GPU and CPU accelerated simple-to-use progressive rendering tools let users to photo-realistically render a scene while allowing to continue working on the same model. New object-oriented mechanism of structural elements helps third-party developers to create their own niche applications, offering their clients high-quality solutions and modern user interface. New features were added to T-FLEX Analysis, T-FLEX Dynamics and T-FLEX CAM - fully integrated into T-FLEX CAD applications that offer parametric functionally for finite-element analysis, motion simulation and CNC machining. T-FLEX CAD 15 also offers significantly enhanced integration with T-FLEX DOCs, professional PLM system, to help simplify data and team management tasks. For a full detailed list of T-FLEX CAD 15 new features, click here. T-FLEX CAD from Top Systems is a powerful 3D modeling and 2D drafting software that enables engineering teams to develop products more quickly, at higher quality standards, providing unique parametric mechanisms combined with production-proven Parasolid® based solid modeling. T-FLEX is written for 32-bit and 64-bit Microsoft ® Windows XP, Vista, 7, 8 and 10 operating systems, and is distributed in various languages to customers around the world. Founded in 1992, Top Systems (Moscow, Russia) develops and markets comprehensive, easy-to-use MCAD/CAM/CAE/PLM solutions at affordable prices. For more information about the company and its products, including free trials, see www.tflex.com, www.topsystems.ru or contact a reseller. To find international resellers, visit Resellers page.